We have a very exciting blog hop for you over the next two weeks we are going around the world with our friends at Stampendous. To make it extra special we will be using not only the cuddly creatures but combining them with the wonderful Dreamweaver Stencils which are also part of the Stampendous stable. We have prizes so would love you to join in with us as we hop around the world for 2 whole weeks, REMEMBER the hosts are House-Mouse and Friends and they are a challenge blog so to play along please add you link on their blog we are really looking forward to seeing your creation there, full instructions and links are at the bottom of this post. So for the next 2 weeks the Woodware blog will look a little bit different I will share some ideas and send you on your way with links to our team and to the Stampendous and House Mouse and Friends Monday Challenge Blog. I hope that we get good enough weather this summer to need to use a fan to keep us cool like the HappyHopper Cool-it with the Chevron stencil in the background. 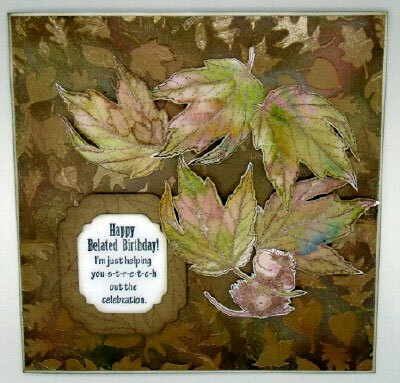 Here is Kim X’s card but you have to pop over to her blog to see the how to, and the extra cards that Kim has made with Fall Float and Fall Flight. We’re celebrating stencils, and using them with our House-Mouse Designs® images. We’re going to bring you tons of inspiration over the next two weeks, and we can’t wait to see what you enter into the challenge! You may use ANY House-Mouse Designs® images or characters on your project, and any stencils and stenciling techniques that you like. There is never any purchase necessary to enter. And, of course, as always on the HMFMCB, “anything goes” is always an entry option. Link your entry to the linky tool by the end of Friday, April 8, 2016. Lovely cards!! Each of the designers is doing an awesome job!! 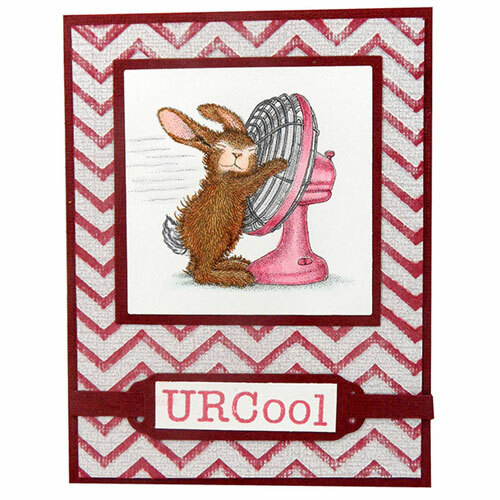 Love the chevron stencilling and the cool bunny image. Beautiful floating mousey in Kim’s card.